Mercy Kerin is this week's SCS Featured Stamper. I've been blog stalking Mercy for some time now. You must check out her blog, Lord Have Mercy! and her SCS Gallery here! I love the layout and wanted to keep it as it is. I changed the colors, the designer paper and the stamp set (since all I use is Stampin' Up!). I embossed my image using black EP and then colored the image using markers and my Blender Pen. I omitted the button and didn't take my paper piercing all the way around the large layer but filled in the corners. This card has many layers, nine (9) in all. Add to that the knot on the ribbon and this makes one very thick and heavy card. If I were to mail it (and I'm not), I'm sure it would cost extra postage. You could easily leave off some layers and it would still be a lovely card but I have to say, this is one of my favorites just as it is. Perhaps I like it because it does sport all the layers, which I don't do often. Knowing I will be hand delivering this to a sweet young lady allowed me to step out and add all the layers and dimension. 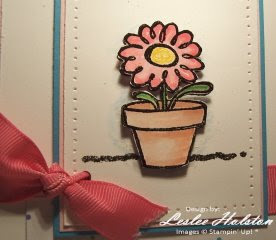 Did I mention that the potted flower was cut out and placed on Dimensionals? The focal image AND the base panel are also on Dimensionals. It is a thick card! But it is good to splurge occasionally! 1) When the bow/knot is so close to the layer that it doesn't want to sit right, try using the slot punch on the layer and threading your ribbon through from the top, running it underneath the layer. 2) Blender pen on Whisper White card stock tends to pill the card stock if you work it too much. Be quick and don't let it get too wet. Ask me how I know...hmm. Thanks, Mercy, for your inspiration! I encourage all my readers to check out Mercy's blog. There's tons of inspiration there and lots of talent too! 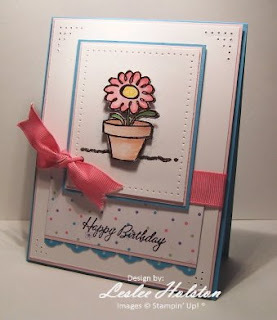 You just might be inspired to add on more layers and hand deliver a card or two! Thanks for stopping by today. Make it a great one!